Prime Ventures is a Bangalore-based early stage fund led by serial entrepreneurs Amit Somani, Sanjay Swamy, and Shripati Acharya. The fund is focused on building disruptive companies out of India, powered by tech and product with a focus on Indian or Global market. 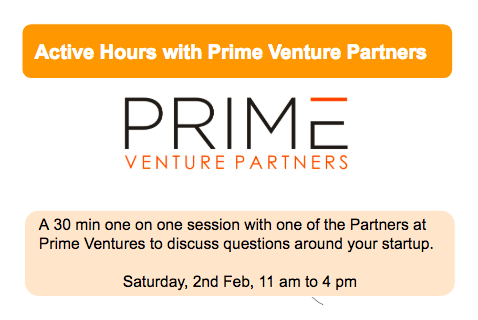 What is Active Hours: A 30 min one on one session with any one of the Prime venture partners or investment team members to discuss all things startup. If you are a founder and have questions around Business Model, GTM, Pricing, Hiring, Product-Market-Fit, Fund Raising, etc. you should apply. Please note, this is NOT a fundraising pitch but a collaborative brainstorming session. Who should apply: Early stage entrepreneurs solving large problems with tech and product at the core. To make it meaningful, please share as many details as possible. We will curate the shortlisted list of companies based on available information. We should be able to accommodate about 15-20 companies.